Have you ever just needed a friend to come through with some wise words to help you through a particularly rough day? Maybe your sense of self-worth is shot because you got a bollocking from your boss or a bad grade on an exam? We've all been there. The absolute babes at Babe Vibes know how real the struggle is because they've launched a cool project called The Pep Talk Generator. It's no frills, no fireworks, just straight up good vibes. 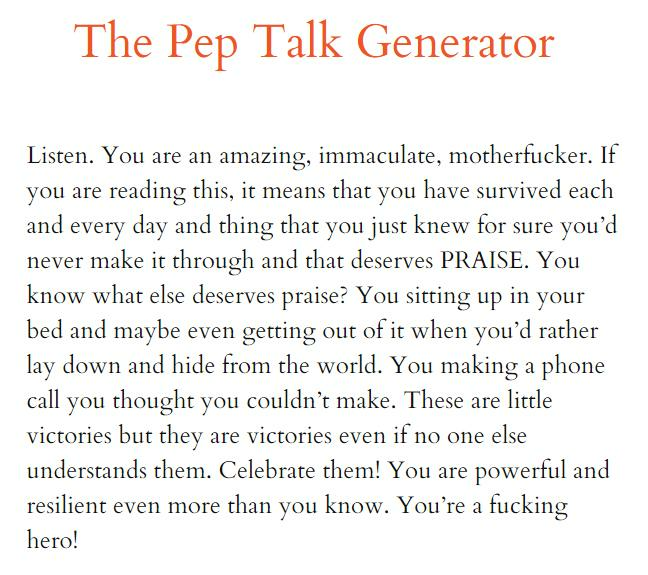 Instead of consuming and internalizing all the crappy internet stuff you read, The Pep Talk Generator is committed to letting you know how completely rad and amazing you are. You already knew you were a fricken' hero. But here's your daily reminder! Try this cool generator and thank us later.